Your app is dead, and you don't even know it. Your church app is dead, and you don’t even know it. Come on son, are apps really dead? Of course they are not. However, how we think of our church app is. We need to understand their current use and in order to best serve our audiences. But first, why such a strong statement on the state of apps? If you’ve been reading the reports across the web, especially those who gauge interest levels in perspective engaged user bases, you undoubtedly have come across reports that apps are dead, that they are not being used, and we need to figure out a new way forward. 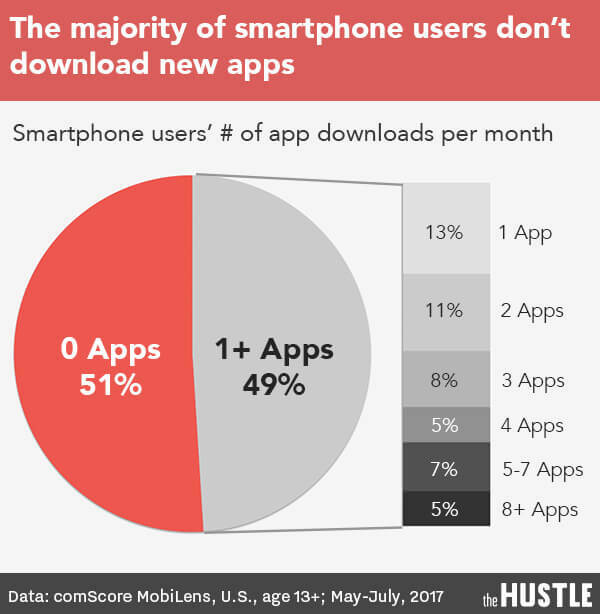 TechCrunch came out with a beautiful interpretive post about the current state of apps in their piece, “Majority of U.S. Consumers still download zero apps per month.” This post was based on comScore’s white-paper post on “The 2017 U.S. Mobile App Report“. We even got the most recent iteration of The Hustle in our inbox this AM that decried the state of apps. News agencies are getting lit up like fireflies with apps, and churches are left wondering what they can do. When you take this news into consideration, and the most recent news from Apple that has left a lot of church app developers dead in the water (no internal linking, no embed codes, no one-platform-for-all), you wonder what you can do as a church to effectively reach and minister to the people in your congregations. Here’s the thing though: Apps are NOT dead, they’re just being used differently than you’d expect. It’s pretty easy for people to get stoked on a new app in the iOS store. As churches, we think that just because we create an amazing new app, that everyone will go out and download it … and then use it every single day. That’s just not going to happen. We’ve discussed this before at great length, doing our best to communicate to you that your app is just one more tool in your toolbox, helping your internal church audience stay engaged throughout the week. Can we help you interpret the articles on the death of apps? Let’s first get our heads around the fact that church apps are not dead. Once we do that, we can attempt to wade through the water of what they’re being used for currently and what we can expect our people to do with them. Perhaps it’s best to look at this from a workflow perspective. If you have developed a church app, this would be your perfect case use for it on a regular basis. Your church develops or commissions a church app. You make a large push for your audience to download your church app. You reach the max saturation point and roughly 70% of your internal audience downloads the app. Out of that 70% engaged audience, about half of them gives to your church in-app. About 25% of your internal audience uses their app once a week, for only a few minutes each. Your internal audience continues to use the app throughout the week, checking on events and sermon content. They never download the app again, because it’s on their phone and it automatically updates. This is your best-case scenario. And you know what? It’s pretty solid! You have an engaged audience that likes to use one of the tools that you have provided for them. You should feel good about it and keep it going strong into the future. The problem begins when we put unfair expectations on our church apps. None of them are magic. Church app developers like Tithe.ly and Subsplash are solid, but they cannot perform some kind of magic to keep your audience engaged every single day. Your audience defines their own use, and because we are working with people here, that looks different from person to person. The best thing we can do is to create the best app possible and pray for people to love it and use it on their own. Here’s the bottom line on church apps. You need to think about apps differently. People download an app once and some never look at it. Good apps get very little engagement, but they do get it. You need a church app, because your audience wants a church app. If people only download one app every other month, do everything you can to make sure that app is yours. We’ve done a lot to help you maximize your impact with church apps and have partnered with the right church app providers, so you can have your best shot at making stuff happen. Now it’s on you. Make an app. Make it pop. Keep it poppin’. Super-helpful information and perspective! Thanks for the post. Thanks Patrick! Always good to receive compliments from you. We love your work!